The Miho Museum houses an impressive collection of Asian, African and European art, but perhaps even more impressive is the architecture of the building itself! The museum began life as the private collection of Mihoko Koyama, the wealthy leader of the religious Shinji Shumeikai group. Koyama gathered antiquities for decades with the intention of exhibiting them someday. The small but beautiful Miho Museum was designed by renown architect Ieoh Ming Pei, also known as I. M. Pei. Pei designed the Louvre Pyramid in Paris and National Gallery’s East Hall in Washington. Read on to find out more about this and other incredible destinations to view arts in Kyoto! The first order of business was to allow access to the museum itself, which was to be built on a mountain in the lush natural beauty of Shiga Prefecture, about an hour from Kyoto by bus. Under his direction, Pei’s team drilled a hole through the mountain and connected it to a nearby highway via tunnel bridge. The Miho Museum itself is built into this mountain, with around eighty percent of it underground. This is because the architect wanted to ensure the building’s harmony with the natural landscape. For the museum’s design, Pei drew inspiration from the ornate temples of nearby Kyoto. The museum benefits from luxurious high-end finishes and details, since Ms Koyama, who commissioned the project, could definitely afford it. Pei nicknamed his creation the Shangri-la. At the beginning of the project, Mrs. Koyama’s collection was mainly rare antique Japanese tea ceremony utensils. It was I. M. Pei who encouraged her to expand into other areas of art and culture when they first met to discuss the commissioning of the museum structure. 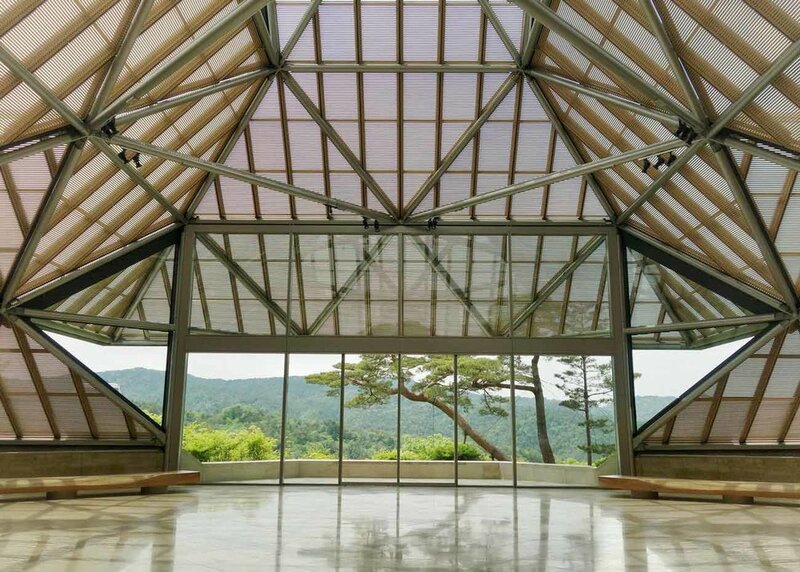 The Miho Museum’s current collection stands at about 3,000 pieces. Anywhere from 250 to 500 of them are exhibited at a time, and it includes ceramics, sculpture, Japanese silk screen paintings and more. Below we guide you through some of the highlights of the museum, or you can take a look at some of the other crafts available in Kyoto! The Miho Museum’s displays are organized according to origin and date. Highlights include the antiquities of Ancient Egypt. The Statue of a Goddess comes from Egypt’s 3rd century BCE. 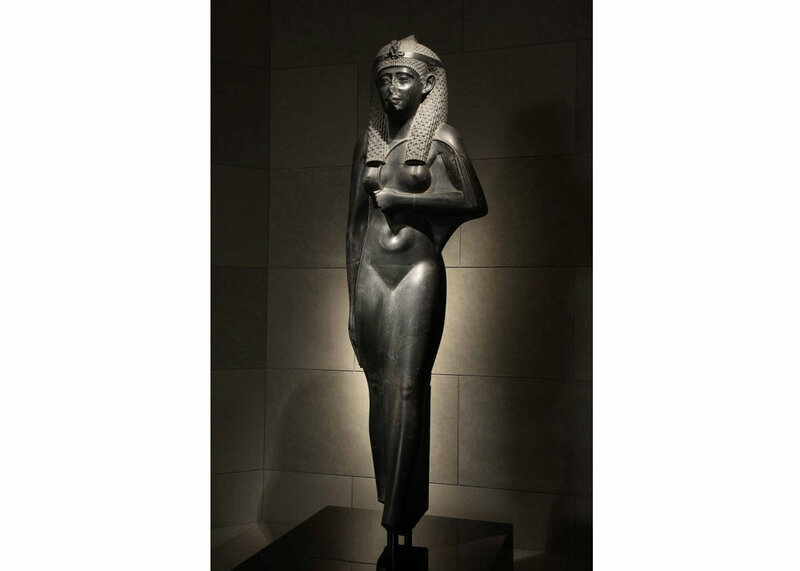 Carved from granodiorite and nearly 160cm or five feet tall, she reigns over the museum’s Egyptian gallery. The queen is believed to be formed in the shape of Isis, Ancient Egyptian goddess of nature, magic and womanhood. The Standing Buddha comes from Gandhara – modern-day Pakistan – in the 2nd century BCE. Because of its excellent condition and enormous stature (8 feet/250cm tall), the Standing Buddha is one of the highlights of the Miho Museum. The Miho Museum opened to the public for the first time in 1997. Since then, the museum has attracted over 100,000 visitors annually from around the globe. One of the museum’s main attractions is the uniquely beautiful architectural design of Mr. Pei. But the collection itself is also a draw. Koyama collected each piece knowing it would someday be exhibited, so the beauty of each piece was carefully considered. It was her belief that people like to be surrounded by beautiful things. Be sure to visit the Miho Museum and its inspiring art and architecture during your next trip to Kyoto. What do you think about the Miho Museum? Let us know what you thought by leaving a comment below! Open: 10:00 to 17:00, closed Mondays. More info here. Transport: From Kyoto station take a 15 min train to Ishiyama Station (石山駅), then take the Teisan Bus for 50 mins.